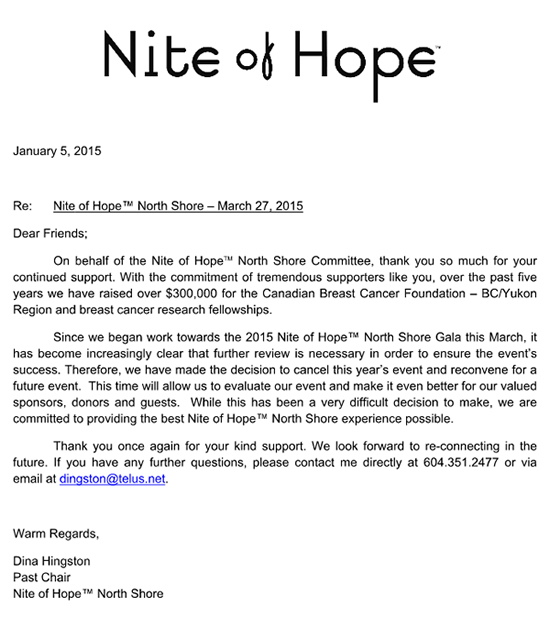 Nite of Hope™ North Shore is a gala dinner, fashion show, silent and liveauction held each fall on the North Shore. All of the monies raised from the event support breast cancer research fellowships provided by the Canadian Breast Cancer Foundation – BC/ Yukon Region. The Nite of HopeTM concept originated sixteen years ago through the efforts of the Founder, Judi (Miller) Knapp. The combined events in Richmond, White Rock and the North Shore have raised in excess of $3.7 million for breast cancer research initiatives in BC.